What credentials should individuals or employers choose? Project-related work and the number of project-related jobs are growing too quickly for our approaches to professionalism to keep up. You don’t have to look to hard to see that the world of work is becoming more focused on projects. I don’t think it’s just project professionals who would say that – business leaders are also aware of the fact that projects are a core part of any company, and project management standards and approaches are being applied to more things. Ben Snyder even called his book Everything’s a Project. In parallel to that, the role of the Project, Programme and Portfolio Office is growing. There are different types of roles available now to people who want to work in projects. You could be a PMO specialist, a risk professional or a project support officer. The management frameworks and organisation structures that support project-based work are in use in many companies. But what does ‘project management’ mean? While the growth is good, what I am also seeing is that project management has different interpretations for different people. Project management jobs are offered with salaries of £20k to upwards of £80k. That can’t possibly be the same job with the same responsibilities. Project management ‘professionals’ (i.e. you and me) have taken the approach that industry bodies are the right groups to explain what project management is. In the US, this is relatively clear, as PMI sets the standards for what project management means. I don’t say this because I’m a particular fan of the Project Management Body of Knowledge or the PMP credential, but because in the US there isn’t as much competition between industry bodies. In the UK it is a different story. We have the Office of Government Commerce, which produces the PRINCE2 and MSP frameworks. These are the de facto requirements for project and programme managers over here. We also have the Association for Project Management which is affiliated to the IPMA. They have their own body of knowledge and credential scheme. 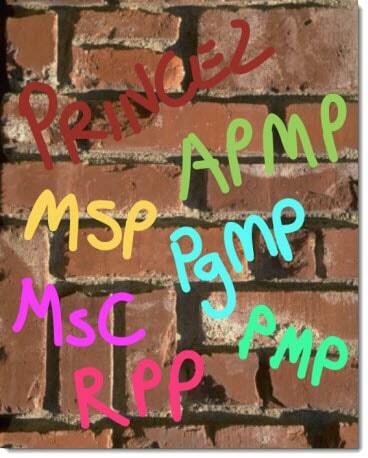 Then we have a small but relatively active PMI Chapter, so there are people with PMP and other PMI credentials. For individuals, it’s worse. Most employers advertise for people who are PRINCE2 certified, but that course won’t teach you to do proper scheduling and it certainly doesn’t reflect your experience in the field. So should you get PMP as well? What about the new Registered Project Professional designation from APM? This is in its infancy but the idea is that people who have RPP then adopt Chartered status and become Chartered Project Professionals when the APM is awarded its Royal Charter. That will apparently move those people into the same stratosphere as Chartered Accountants or Chartered Surveyors. So let’s say you want to go for that. Who will pay for it? Many employers will only pay membership fees to one professional body for you (or none at all). Do individuals have to pay for PMI membership and APM membership and ask their employers to send them on PRINCE2 courses every 5 years for recertification? I don’t have the answers. This is a challenge for industry bodies, employers and individuals. Professional bodies won’t suddenly stop producing certificate-based courses. It is how they make money and how they convince employers that they are relevant to today’s working environment, and for the most part the courses and credentials are very good. I don’t have an issue with the standard of project management education – I just worry that there is too much off it, which makes it hard for employers and individuals to know what is the best option for them. I can’t see that any of the professional bodies in the UK would give up marketing their services because someone else is doing a similar thing. What I would like to see is more alignment and collaboration between them, so that it is easier to compare bodies of knowledge, standards, frameworks, certificates and credentials and whatever else is out there. This has started – there is movement towards bridge courses between credentials, and training courses are being marketed specifically at people who have a different qualification. We need project management as a profession to hang together, not become more fragmented. The project-based workplace is here to stay, and the discipline of project management needs to catch up pretty fast so that companies see the value and know where to turn for professional advice. What should we be doing to help that happen? This article is based on an interview I gave for The Project Management Podcast last year. I think the same thing is happening in the still-nascent and evolving industry of social media/digital marketing. There was one attempt that I remember by several social media “luminaries” a couple of years ago to establish a global social media association (I think it was even called International Social Media Association, or some variation thereof) that would provide, among other things, credentialing based on participation in a ~US$3,000 training course offered by said association. The ensuing debate — “flame war” is probably a more accurate term – involved folks hurling accusations of profiteering, lack of authority, lack of established credibility, overinflated egos, and all manner of other professional and personal insults. Regardless of the perceived or actual worth of the organization itself, the bottom line is that it quietly shut down not too long after it launched. That’s not to say that others haven’t tried to rush in and fill the void it left behind, but no one organization has stood out and taken the crown. I’ve certainly seen way more “Certified Social Media Specialist” designations on LinkedIn than I care to contemplate. Given the incredibly fast speed at which social media is changing, compounded by the difficulty in training someone on all the bodies of knowledge one must have in order to be considered “social media certified” (marketing, advertising, business communications, PR, customer service), it’s no surprise that no organizatoin has yet to emerge as the gold standard in social media certification. I’d be very surprised if one ever does. Maybe I just need to accept that the same is happening in project management and there will be no gold standard certification to help employers and candidates alike. It’s a shame, but I do understand that. In a way, the more project management there is in the world, the better, but I hope some of the not so good courses don’t impact the way employers view those project managers who have taken the time to get decent credentials and experience. I think I’ll revisit this topic in a couple of years and see where we are then. A good one! Thanks for sharing your brilliant ideas! Hi Elizabeth, this makes me think of another issue I am seeing at the moment regarding qualifications. As an experienced Project Manager, I don’t have a degree. I started out doing project based work at a junior level and have built my experience and knowledge. However, I recently reached a point where I was not getting job intereviews because having a degree has become compulsory for nearly every job. I decided to get my MSc (this MSc is accredited by APM) and make it official, whilst also overcoming the no-degree barrier. But many of the students on my course (probably over 90%) have never even worked in an office, and certainly never on a project. Their undergraduate degrees vary from Business to Photography. This concerns me as future employers will employ these students, realise they don’t know what they are doing and minimise the value of such a qualification. It also concerns me because the students think by having the qualification it makes them Project Managers. Kirstie, I think you make a really good point. Academia isn’t helping the confusion over qualifications by encouraging those students to present themselves as fully fledged prject managers after they graduate. Having said that, they probably have a lot more skills after an accredited MSc course than by doing a 5 day training course. I hope that employers will realise that there is more to being a good project manager than just having a degree and realise that the course is probably churning out some excellent project managers as well. Interpersonal skills are the kind of thing that a project manager needs that can’t be easily taught. However, what makes you think that the students graduating from your course will not be good project managers? We all have to start somewhere, and university projects are still projects. What, in your mind, does qualify someone to be a project manager if an accredited MSc does not? Would a course that offered a mix of experience and academic learning be more appropriate? By the way, I think that jobs that require you to have a degree once you have got to a certain point in your career and have built up some experience are to be avoided. I don’t have any insider knowledge, but I imagine that HR teams are often swamped with CVs and asking for degrees is just one way to filter out applicants. If you meet 80% of the other criteria, apply anyway! present themselves as fully fledged prject managers after they graduate. accredited MSc course than by doing a 5 day training course. probably churning out some excellent project managers as well. that can’t be easily taught. While I can’t speak to the situation in the UK, here in North America most employers see an undergraduate degree as evidence that you are capable of learning. After you’ve been working at a certain level for a few years, your success is usually considered equivalent evidence. But at some point, you will run into a ceiling, because the lack of a degree is indicative of a lack of interest in learning. The operative word in project management is “management.” Employers hire us not because we’re “qualified,” but because they believe we’ll be successful as managers. Thus, every hire represents the assumption of some degree of risk by that employer. As Elizabeth points out, there are a lot of credentials, models, and frameworks for managing projects, but they only add value by providing a structure and vocabulary. Management experience, plus a mastery of that vocabulary and those structures, evidences a lower risk than either attribute by itself. Consequently, experience plus credentials plus the ability to apply all of that theory in a job interview will usually get a candidate hired. Of course, that doesn’t mean a newbie with only a credential won’t get hired. And it doesn’t mean (s)he won’t be successful. But in a modern economy where “everything’s a project,” there’s going to be a lot of open doors at the entry level. And a lot of churn.